Farengar Secret-Fire, a Nord elemental mage, is the court wizard of Jarl Balgruuf the Greater. He advises the Jarl when Whiterun is facing a magic-based threat. He is also doing research into dragons and will ask you to retrieve a dragon tablet, found in Bleak Falls Barrow. As a court mage, he is one of the few people outside of the College of Winterhold who will sell you spells. Farengar can possibly be killed during The Whispering Door quest. Expecting that your business involves the current war, he will greet you with, "Come to Dragonsreach to discuss the ongoing hostilities, like the rest of the 'great warriors'?" He will then elaborate on the subject: "It seems this damnable conflict has claimed everyone's passions of late. Me, I prefer my books, and my spells." He will then discuss his passion for the magical arts: "There's a tranquility in magic, don't you think? It is simply energy, to be harnessed by those with the will and knowledge to do so." 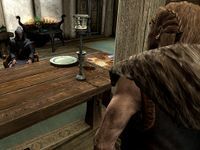 If you go near him before you have completed the Bleak Falls Barrow quest he will somewhat rudely comment by either saying "I thought you were already on your way to Bleak Falls Barrow, the Jarl is not a patient man and neither am I." Or when exiting the conversation he will say: "Away with you!" He may also give a tutorial for enchanting items at the arcane enchanter in Dragonsreach. If you do not immediately release Odahviing after capturing him in Dragonsreach, Farengar will make an appearance to introduce himself to the dragon and attempt to perform "tests" on him, but will flee when the trapped dragon demonstrates his fire breath out of frustration. Farengar wears blue mage robes and a pair of boots. He is equipped with an iron dagger and carries a selection of common loot and gold. During the quest The Whispering Door, he also carries a copy of the key to said door. He knows the Destruction spell Firebolt. 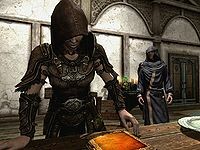 Enchanting Tutorial: Use an Arcane Enchanter. "This is a priority now." 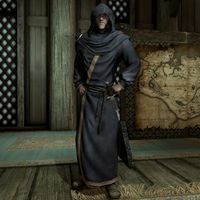 After thanking you for coming to him with your concerns about Riverwood's safety, Jarl Balgruuf will introduce you to Farengar: "Come, let's go find Farengar, my court wizard. He's been looking into a matter related to these dragons and... rumors of dragons." As you are walking over to see Farengar, he'll say, "I'll introduce you to Farengar. He can be a bit... difficult. Mages. You know." or "Farengar is probably puttering around in his lab. Day and night. I'm not sure he ever sleeps." When he gets to Farengar's lab, he'll say, "Farengar, I think I've found someone who can help you with your dragon project. Go ahead and fill him/her in with all the details." If you've previously spoken with Farengar, he'll say, "Farengar, I see you've already met my new friend here. I'm sure you two will get along famously." Balgruuf: "This is a priority now. Anything we can use to fight this dragon, or dragons. We need it, quickly. Before it's too late." Farengar: "Of course, Jarl Balgruuf. You seem to have found me an able assistant. I'm sure he/she will prove most useful." Balgruuf: (to you)"Succeed at this, and you'll be rewarded. Whiterun will be in your debt." "Hmm. I think you're overheating that essence of spriggan sap..." Alchemy >= 25 "What? I'm not even... ah, I see. You have some knowledge of the alchemical art." "Isn't it dangerous to leave filled soul gems near an unwarded pentacle?" Enchanting >= 25 "Where? I would never... ah, I see. You are a fellow enchanter." "Look out - you're about to step in your own Shock Rune." Any magic school >= 25 "What? I never even cast... ah, I see. You have some knowledge of the Higher Art." "Never mind. I'll wait for Jarl Balgruuf." 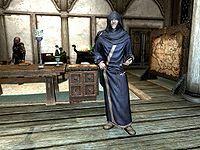 "The Jarl can be found in the Great Hall, probably sitting on his Jarl's throne. Not over here in a wizard's laboratory." "All right. Where am I going and what am I fetching?" "Straight to the point, eh? No need for tedious hows and whys. I like that. Leave those details to your betters, am I right?" "What does this have to do with dragons?" "Ah, no mere brute mercenary, but a thinker - perhaps even a scholar? You see, when the stories of dragons began to circulate, many dismissed them as mere fantasies, rumors. Impossibilities. One sure mark of a fool is to dismiss anything that falls outside his experience as being impossible. But I began to search for information about dragons - where had they gone all those years ago? And where were they coming from?" "Just tell me what you need me to do." "You are eager to begin your adventure. Excellent. The sooner begun, the sooner done, eh?" Regardless of your choice, your next question will be to ask what he needs you to do. 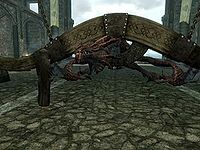 He will tell you, "I, ah, learned of a certain stone tablet said to be housed in Bleak Falls Barrow - a 'Dragonstone,' said to contain a map of dragon burial sites. Go to Bleak Falls Barrow, find this tablet - no doubt interred in the main chamber - and bring it to me. Simplicity itself." If you already have the Dragonstone in your possession, you can hand it over to him. Farengar will be pleased by your preparation "Ah! The Dragonstone of Bleak Falls Barrow! You already found it! You are cut from a different cloth than the usual brutes the Jarl foists on me." If you don't have it with you, Farengar will now offer you his normal dialogue options. This is the merchandise found in Farengar's merchant chest. These items are only available if purchased from the merchant; they cannot be pickpocketed or stolen. They are restocked every two days. If you advance The Whispering Door far enough to be able to kill Farengar, and he is killed at some point before The Fallen, the other people involved in the interrogation sequence will react as if he were still alive (talking to him, etc.) despite the fact that he is dead. Sometimes when using Farengar's arcane enchanter while he is sleeping in his bed in the next room, he may still comment on your enchanting progress as if he was awake. ? This page was last modified on 23 February 2017, at 17:13.